It was crazy hot in New Jersey the last two weeks that all I wanted was a glass of cold drink, and chill!! 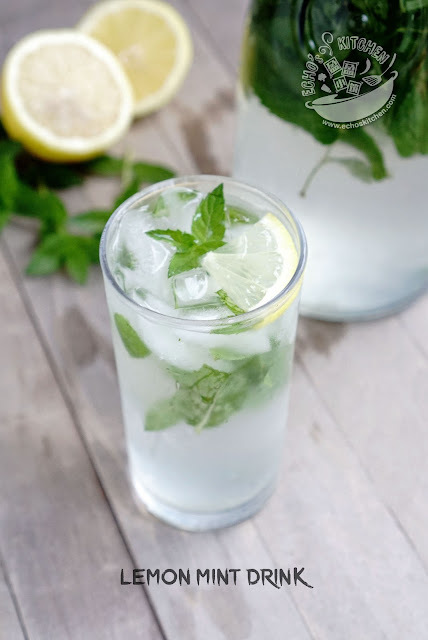 The only good news is that the mint in my garden is growing so well, and it is great for making this chilly refreshing drink! A friend of mine lease a small piece of land from her husband's company as part of the company's social responsibility program. The land is only meant for activities that could enhance the environment. They then decided to plant some vegetables. Last two months were interesting for most gardeners in NJ, my friend and I shared information and progress of our gardens and now we share our crops! She and her husband are both from the northern part of China, thus the French bean they planted is also a northern Chinese species called flat French bean (扁豆). 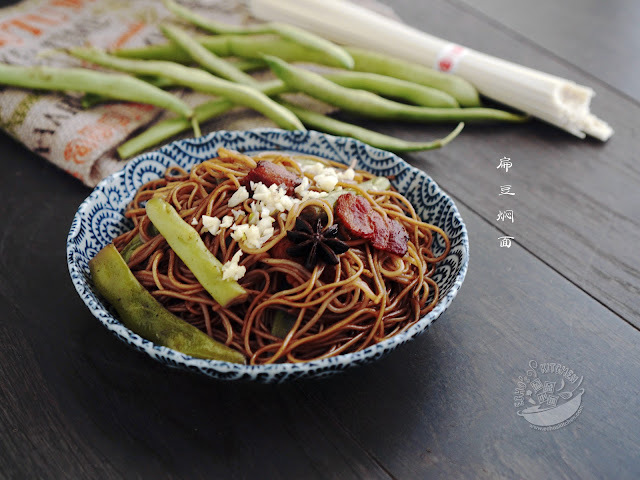 3 Bunch of dried noodle (approximately 300 gm) Note: You can use fresh, uncooked noodle too. 1. Clean and remove the rough string at the side of beans, break it into about 2 inches long, shorter if you prefer softer beans. 2. Mince ginger and garlic，slice chili length wise or cut it into slices, chop spring onion. Slice bacon into about 1 inch thick. 3.Heat up a wok or a deep bottom cook ware, DO NOT add oil, cook bacon until fat/grease release, and push aside cooked bacon, remove some oil if you want it leaner. 4. Now add star anise, minced ginger, and half of minced garlic, half of chopped spring onion, stir fry until fragrance. 5. Add French bean, and stir until the colour changed, about 2 minutes. Add 2 1/2 cups of water, the beans should all submerged into water, bring to boil, add soy sauce, salt to taste. Scoop out a big bowl of stock, approximately 1 cup worth, and leave aside. Note: If fresh noodle is used, add only 2 cups of water for cooking. 6. Add the remaining chopped spring onion and minced garlic into stock, stir well. 7. 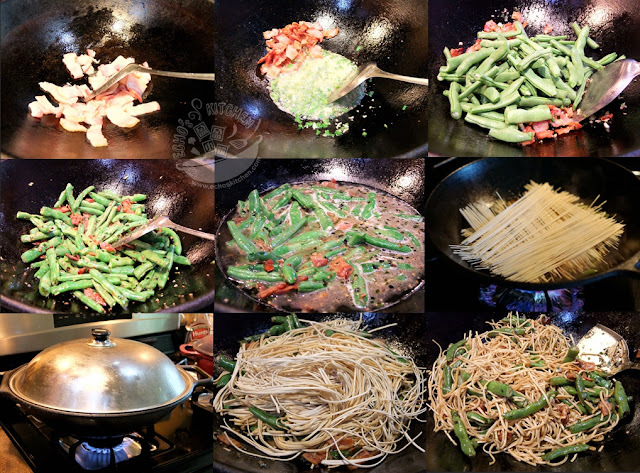 Turn heat to medium now, and loosely spread noodle over the beans, cover with lid, and cook for 5 minutes. After 5 minutes, use a fork or chopstick to lightly loosen up the noodle, spread half of the stock over the top of noodle, as evenly as possible. Cover with lid and cook for another 5 minutes again. Repeat the same process for the remaining stock, and cook for another 5 minutes or until all liquid almost dried out. 8. At the end, add some pepper powder, and turn beans and noodle with help of chopstick and spatula, till well mix, turn off the heat and cover with lid, let the noodle sit for another 5 minutes before serving. 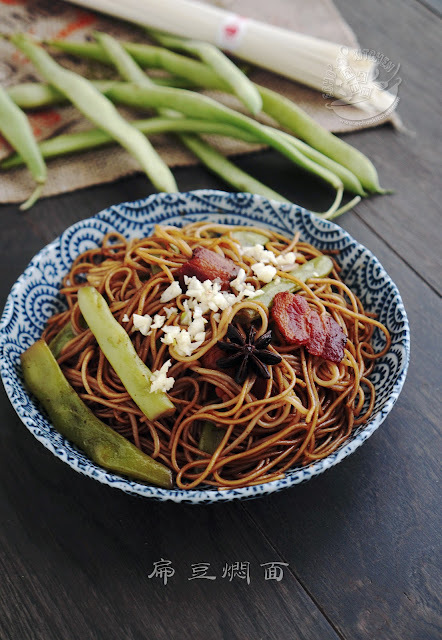 9.You could blend together 4-5 cloves of garlic, add some Chinese dark vinegar and soy sauce as a dipping sauce to this noodle. The first batch of Potato I put in my garden are flowering now，its about time to check out some baby potatoes to make this really delicious dish. There is no comparison to fresh potato from your own garden, really!! Goa is the smallest state located in south west of India. Its culture is a mix of east and west due to the Portuguese ruling in 1500s. 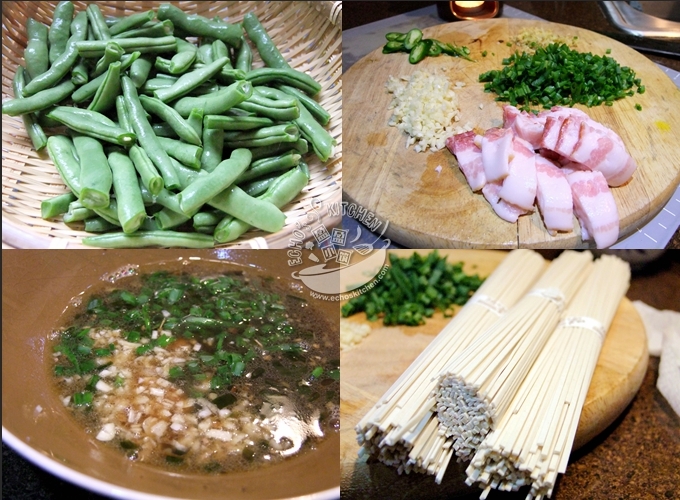 The eastern influence is not just in the culture, also the cooking. Seafood is the main cooking ingredients there, as well as major source of protein. As I grew up eating seafood, Goan dishes was one of the very first Indian dishes that I liked, and still do! I love a bowl of Ma Po To Fu over hot steamy rice, a good plate of Ma-po tofu is usually very spicy (as in chilli heat) and has a strong characteristic of "Mala", the numbing sensation came from Sichuan Pepper (花椒) used in preparing this dish. The combination of these two spices are so addicting that I always have a box of Sichuan Style minced meat ready in the fridge, so that I could always cook this dish in under 20 minutes! It's mid summer and it's also harvest time for cucumber. It is fascinating how nature has it, the coolest produce's harvest time is also the hottest of the seasons! When the temperature outside reaches 90-ish these days, I decided to go out to my garden, pluck a cucumber and a handful of mint leaves. Chill them a little in the fridge. 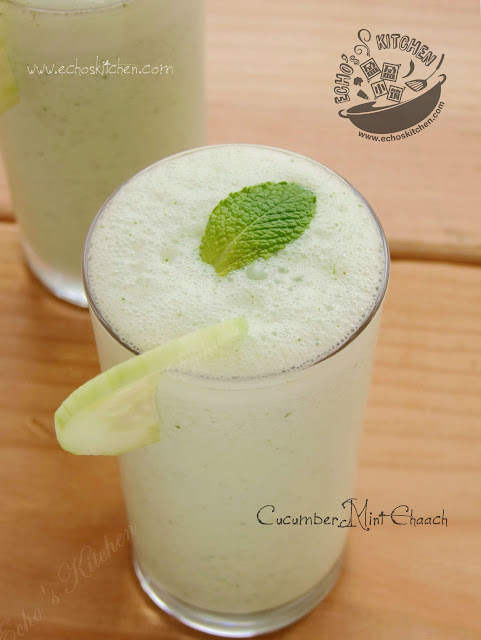 And blend them into this cooling and ever so refreshing Cucumber Mint Lassi, and I thank nature for what it provides! 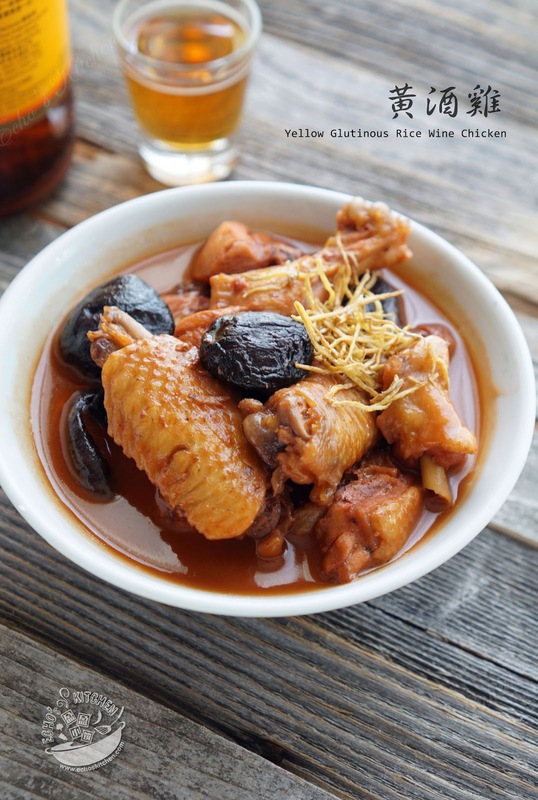 This is a traditional confinement dish for the Fujianese/Hakka clan of Chinese. We the southerner add glutinous rice wine in all our confinement foods. It is believed to be good for the mother and help to recover from childbirth. Though it is mainly meant for confinement, my mum will sometimes make this dish for our meals. It's been quite sometime since I had this dish and since I have a couple of bottles of Red Yeast Rice Wine I made in the pantry, I made this dish for lunch to share with a friend, both of us enjoyed it very much. Its summer time and my Amaranth at the back yard is growing so well, I have been thinking of a bowl of fish ball Amaranth soup since the day I sow the seeds! I waste no time to make this soup with the Fish and Turkey Fish paste I saved up from making Stuff Chilli the other day.